Scummy, cloudy, oily film hot tub water got your down? We’ve got the solution! There’s no mumbo-jumbo here. No long process. 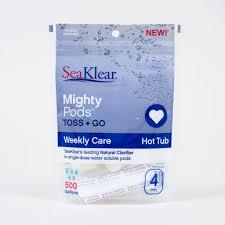 Make it easy on yourself and get SeaKlear Mighty Pods that will banish scum, oil & cloudy water from your hot tub. They’re an all natural clarifier-the best available-for clean, clear, carefree water that’s now in a convenient pod. Just toss and go. There’s no guesswork. They’re pre-measured for the perfect dose every time. You’ll love not having to deal with overdosing & messy bottles. Safe for all sanitizing systems and filters. Add a SeaKlear Mighty Pod to your weekly sanitizer routine and take your water from good or bad to better! Toss in a pod a week. Run the jets for a few minutes to dissolve the pod and you’re set. Each pack contains 4 pods that treat up to 500 gallons each. Your whole family will appreciate that they’re all natural, eco-friendly and biodegradable. There are no harsh chemicals that will ruin your hot tub experience. And, they’re made in the United States so you know they’re safe and made to the highest standard. Order now from Olympic Hot Tub’s online store. Problem solved! We love you Mighty Pods ♥.